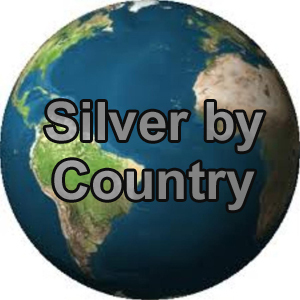 We thought it was time to do a little reasearch and detail and list the worlds silver production by country. Among the top countries are Mexico, China, Peru (might be a surprise), Australia, and Russia. More details below, thanks for reading. While somewhat tied to the gold markets, silver prices declined significantly in 2013, even though trends for both gold and silver point to gains in 2014. However, some of these gains will rely on silver production for 2014 with several countries producing prodigious amounts of silver for the world market. With a 2012 production of 162+ million ounces, Mexico is far and away the largest producer of silver in the world. Both Fesnillo and Goldcorp have several assets producing silver in conjunction with other metals such as gold, copper and zinc and with projected reserves of well over 500 million ounces, these companies should keep Mexico in the top slot for some time to come. Up from 104 million ounces, China silver mines produced over 117 million ounces of silver in 2012, surpassing the silver output from Peru to become the second highest silver producing country. China is also the world’s largest producer of gold in the world. Although Peru saw a slight increase in production from 2011 to 2012 (111 million ounces up from 110 million ounces), the output from China still outpaced it. Even though Peru is now the third largest country for silver production, with in-ground assets exceeding 120,000 tons (according to USGS), the potential is there to outpace anyone in the world. With 2012 production at just under 57 million ounces, the mines in Australia also have the potential to increase dramatically. With in-ground assets that could exceed some 69,000 tons, much of the silver supply in the country comes from the silver bearing lead ore galena which increases production costs. Overall, Russia’s 2012 silver output stood at 45 million ounces, most of which was produced by a single company, Polymetal. Their mine in Central Siberia produced over 5% of all Russian silver production with corporate silver production being responsible for well over half (26%) of all Russian silver production for 2012. Even though silver is used like gold as an investment hedge metal, silver also has many industrial uses which accounts for most of the demand for silver. Although over half of all silver production goes to jewelry, silverware, bullion and other sources, the largest bulk (46%) of all silver demand is for industrial purposes. While overall global production rose slightly for 2013, the price dropped dramatically. Even though trends for 2014 do show a rebound, as an investment metal, silver may not be your best hedge against future economic issues.